Eat with one of the last remaining hunter-gatherer communities. This week we’re going to be telling what might be the oldest food story in the world. 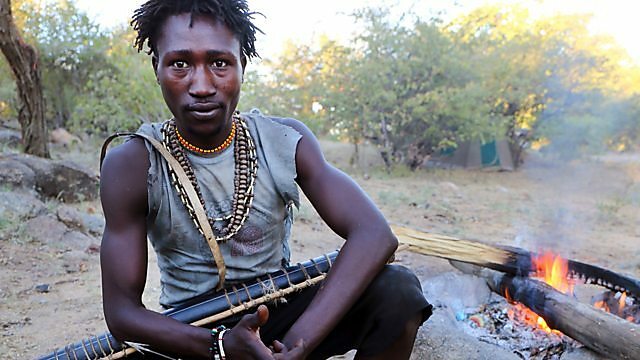 The Hadza of Tanzania, east Africa, are one of the last remaining hunter-gatherer communities in the world and the last remaining link to our ancient food past. The total population of the group now stands at around one thousand, with up to two hundred living as pure hunter-gatherers, who grow nothing, and practice no form of farming. They’ve lived in this part of east Africa for at least 40 thousand years and food for the Hadza has remained relatively unchanged. We meet the community, who walk in the footsteps of our human ancestors, joining them as they hunt for porcupine, climb 30 feet up a tree in search of honey, dig deep for tubers and snack on berries picked from trees. Through this insight into what our earliest human ancestors ate, we learn about our own human development and the crucial link between the food we eat, and the crucial microbiomes we carry in our digestive systems. Using these discoveries, the Hadza can help give us much needed ideas for our food future. With contributors: Jeff Leach, Founder of the Human Food Project; Tim Spector, Professor of genetics at Kings College London.